Following my last post on the subject, The Apple Falls, two more Apple-1 computers have come up for auction in the past few months, with a puzzlingly wide disparity between the prices fetched. In October 2014, the Henry Ford Museum in Dearborn, Michigan, smashed the previous record by paying $905,000 for a working example of an Apple-1 at an auction held by Bonham’s in New York. Two months later, another working example was auctioned by Christie’s in New York for $365,000, less than half the price paid only weeks before. Both machines included a full complement of accessories and peripherals, although the higher priced example was said to be in “superb overall condition“. These latest sales bring the total number of Apple-1 computers which have appeared at auction in recent years to 13. There are also a similar number of examples held in other museums around the world plus around 30 known to be in private collections. By my reckoning, that still leaves a few undiscovered examples in circulation from the 63 which are thought to have survived out of an estimated total of 175 Apple-1 machines originally built. However, it’s very unlikely that one of these undiscovered treasures will turn up in a junk shop or car boot sale in my neighbourhood anytime soon, as Apple had no UK sales distribution channels at that time. The original batch of 50 units were sold through the Byte Shop, an early computer retail store based in Mountain View, California, and the remaining machines were sold direct by Jobs and Wozniak to their fellow Homebrew Computer Club members located around the Silicon Valley area. A handful were also sold as a result of adverts placed by Apple in two computer hobbyist magazines, Byte and Dr Dobb’s Journal, but none are known to have gone to overseas buyers. A significant proportion of these machines were subsequently taken out of circulation as a result of a generous trade-in allowance offered on the Apple ][ following its introduction in April 1977 which tempted many Apple-1 owners into trading in their ‘bare bones’ machine for the sleek new model, hence the relatively low figure of 63 which are thought to have survived. Given the high prices paid in recent years for Apple-1 computers, there are likely to be some fakes in circulation and authenticating genuine examples will be an extremely difficult task as Apple did not use serial numbers. 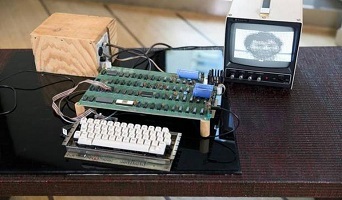 It will be very interesting to see what happens when the next Apple-1 comes up for auction. With around 30 examples still in private hands, it should only be a matter of time before one of these owners succumbs to temptation and puts his or her precious machine up for sale. This entry was posted in Computers as Collectibles and tagged Apple I, Homebrew Computer Club on 11/02/2015 by Stephen J Marshall.